Published Originally by: Jerusalem Institute, JG76 (Winter 2018) by the Institute for Palestine Studies. The recent step by U.S. president Donald Trump to move the U.S. embassy to Jerusalem and his total support for the most extreme demands of Zionism, according to most observers, demonstrate his desire – and that of his vice president, Mike Pence – to satisfy Christian Zionists, particularly evangelicals, in his base. The demand to move the embassy had not been a priority for Israel, or even for the American Israel Public Affairs Committee (AIPAC), the Jewish Zionist lobby in the United States.1 Indeed, it was traditional wisdom that such an inflammatory move would yield little or nothing of benefit to the United States, or even to the State of Israel, while its negative consequences would likely hurt and embarrass the United States and its allies in the Arab world. The embassy move had been standard election rhetoric, mandated overwhelmingly by Congress decades ago, yet every U.S. president for thirty years had dutifully and routinely signed the requisite six-month waiver to delay this step, with little dispute from anyone.2 However, it is now clear that American evangelicals, who pushed for and obtained its implementation, wield considerable power when it comes to Israel and the issue of Palestine, and that such power is used destructively when it comes to any attempt at even a rational – much less a just – policy toward the Israeli– Palestinian problem. Those who are interested in the Palestinian issue may not even know that Palestinian evangelicals do in fact exist. It is therefore useful to learn about the views of Palestinian evangelicals and their position toward Christian Zionism, both to do this group justice, and to recognize their important role in combating the phenomenon of Christian Zionism among evangelicals. Part of the reason for this lack of information is that Palestinian evangelicals are a numerically tiny minority of a minority within the Palestinian community, while evangelicals in the United States number over sixty million, and are influential on significant issues such as the Middle East far beyond their numbers.3 Their influence has been expanded through televangelists and Christian radio broadcasters who propagate their message to Christians who are not members of evangelical churches, but who belong to Catholic or mainline protestant churches, such as Methodists, Presbyterians, or Episcopalians. It may be difficult to define “evangelicals” since some of their core beliefs are readily shared and claimed by all Christians, yet for our purposes we can recognize at least two major elements that distinguish evangelicals, both in the United States and in Palestine, as well as throughout the world, from other Christians: their reliance on scripture as literal truth, and the absence of a formal religious hierarchy. The second distinguishing element of evangelical Christianity was the absence of a formal hierarchic structure that controlled the behavior, positions, and teachings of the members of that denomination. In Palestine, and in the rest of the Middle East, most Christian churches, such as the Greek Orthodox and the Latin church, are formally recognized by the state and represented by an established clergy with the patriarch, the pope, or an archbishop at the head, speaking authoritatively in the name of all believers in his denomination on spiritual, and often also on temporal, matters. Since the Bible was the sole authority for evangelicals, however, church authority was diffuse, and any person could read and interpret the Bible as they saw fit. This feature led to a vast and bewildering variety of teachings and positions among the churches classified under the label “evangelical.” In fact, the evangelical church is splintered into thousands of churches and denominations that enjoy a high degree of independence and self-government, not only in temporal, organizational, financial, and material matters, but also in matters of faith and teachings, including differing positions on relevant issues. Thus, it is difficult to speak of an “evangelical position” toward any issue, including issues such as peace and war, justice, equality – or the Israeli/Palestinian issue. Historically, these evangelical ideas spread from Europe to the United States and later to the Middle East through missionary activities. Missionaries in Palestine set up a number of local churches which drew most of their members from among followers of the traditional historic churches. Members were often attracted by the spiritual and pietistic teachings of the missionaries, as well as by the schools, hospitals, and other social institutions they set up. Among these local churches were the Baptist churches (with their various branches), the Nazarene Church, the Church of God, Assemblies of God, Alliance Church, and other small churches, each of which enjoyed a high degree of separateness and independence, while maintaining close financial, spiritual, and social contacts with the “mother churches” and their headquarters in Europe and the United States. The number of believers in these churches, sometimes referred to as the “born again” churches or mutajadidin, remained quite small compared with the historic churches. Recently, evangelicals in Palestine tried to organize themselves into a loose federation under the name of Synod of Evangelical Churches, but the constituent members remained administratively and financially distinct; the synod has not yet succeeded in obtaining official recognition as a separate and distinct denomination in Palestine. Some members of the evangelical churches continued to nominally “belong” to their original churches, whose administrative services (for inheritance and related matters) were often required since evangelicals did not have their own recognized ecclesiastical courts to administer such services. Most demographic studies usually add the numbers of members of these evangelical churches to the numbers of “protestants” (officially, members of the Lutheran Church and the Episcopal Church) who are among the smallest of the Christian denominations in Palestine. The real influence of Palestinian evangelicals, if it exists at all, is not based on their numbers, which are miniscule, but on the institutions that they operate and on their contacts and connections in the West, where evangelicals do constitute an effective force, once they unite around a particular issue. Christian Zionism was never a fundamental or integral element in evangelical thinking. It was a peripheral movement which grew among some evangelicals, but also other Christians in Europe during the eighteenth and nineteenth centuries. Among its luminaries are Reverend John Darby and Cyrus Scofield. The publication of the Scofield Bible, which included commentary in the margins that reflected the teachings of Christian Zionism, contributed to its popularity among Christians, including evangelicals. This movement had distinct teachings concerning the end of the world and the “War of Gog and Magog,” and taught that certain prophecies will be fulfilled during the End Times, before the “Second Coming” of Jesus. It taught that there will be an “ingathering of Jews” from all over the world to Palestine at the “End of Days,” when most of them will be killed as the Nations of the World under the leadership of the Antichrist will rise against the Jewish people in an apocalyptic war (called Armageddon). The only survivors will be 144,000 Jews (twelve thousand from each tribe), who will recognize Jesus as their Messiah, and convert to Christianity before the Second Coming of Christ takes place, ushering in a golden age referred to as the Millennium: a “Thousand-Year Reign.” Obscure references from different books of both the Old and New Testament were woven into an end-of-the-world drama. Over the years, different rulers and regimes were labeled “Antichrist” and woven into the different and ever changing narratives. Most of these ideas found little currency among Christians until the creation of Israel in 1948, which was viewed as heralding the start of the End of the World drama prophesized in the Bible. These ideas grew tremendously popular after Israel’s crushing military victory in 1967, which was viewed by many Christians in the West as a result of divine intervention on Israel’s behalf, and an indication that the End of the World and the Second Coming of Christ was near. They also saw in it a vindication of their faith in the truth of the Bible, and its ability to predict the future and to impact events in the world at large. The Middle East events created a great opportunity for the secular Zionist movement to take advantage of this particular Christian interest to garner support for its political program. They did this by advancing a number of ideas such as the idea that it is a Christian’s duty to support the State of Israel, which God Himself was supporting, and that such support would result in speeding up the Second Coming of Jesus, which true believers were eager to see. Biblical verses taken out of context and applied to the modern State of Israel were standard features of this approach. For example, the Bible is quoted as teaching that God “blesses those who bless thee [Israel] and curses those who curse thee.” And that “he who touches you [Israel] touches the apple of God’s eye.” Also put forward was the assertion that God’s promises to Abraham applied to the current State of Israel, and therefore that gave the entire land of Palestine to the Jewish people; that what is happening today is a mere fulfillment of promises God made and predictions given through his prophets thousands of years ago; and that these events are clear indicators of the End Times. These colorful views were further popularized in a series of “Christian fiction” books called the Left Behind series by conservative author Tim LaHaye, which sold millions of copies in America. While most Christian churches and theologians rejected these ideas, and even scoffed at those who tried to link biblical prophecies to current events, the Zionist movement made deliberate use of these ideas (which Jewish Zionists rejected on rational and theological grounds) as a tool for political pressure by a Christian Zionist movement actively working in the halls of government and Congress. It did so to procure massive military and financial aid to the State of Israel and to give this aid religious and moral support, as being the proper and true Christian position toward events in the Middle East. In fact, some observers believe that the power of AIPAC came not only from its financial resources and campaign contributions but also from its ability to marshal the support of millions of Christian Zionists for its agenda. For Palestinian evangelicals and other Christians, these influences were very far from their thinking. They fully saw Zionism as a political movement supported by the colonial West and totally inimical to their own rights and aspirations – a movement that wanted to colonize and settle their land and which would eventually subjugate or evict them from it. They experienced as did their Muslim countrymen confiscation of land and denial of rights. They saw that they had a vital role to play in fighting the Zionist movement and in informing their co-religionists in the West of the truth about the situation in Palestine. There is no doubt that there was great embarrassment among Palestinian evangelicals when the heads of evangelical churches in the West took public positions supporting Israel and the Zionist movement. This was compounded when these leaders justified their support for Zionism by quoting biblical verses (usually taken out of context), which gave such political opinions and positions the status of religious dogma. At first, most Palestinian evangelicals preferred to distance themselves as much as possible from taking any political position. In this they relied on Christ’s commandment to “Render unto Caesar that which is Caesar’s and to God that which is God’s,” and his teaching that “My Kingdom is not of this world.” Politics was a worldly affair, and Palestinian evangelicals were more concerned with spiritual issues. Such neutrality was not easy, since Christian Zionism considered that God gave the land to the Jews, “God’s Chosen People,” and therefore the very presence of any Palestinian there (Muslim or Christian, evangelical or otherwise) was considered a problem and a danger to the Jewish state and to “God’s plan” for the End Times. So neutrality was not really possible. It is also true that the influence of Christian Zionism on their “mother churches” in the West was also reflected back on some of the local evangelical churches, particularly in light of their financial, spiritual, and ideological connections with such churches, whose members often came on pilgrimage to the Holy Land, having been fully indoctrinated with Christian Zionist ideas. Yet the reality of life for Palestinian evangelicals was totally the opposite of these expectations, and local Palestinian evangelicals found themselves forced to take on the role of instructor, educator, and corrector for their Western brethren, opening their eyes, clarifying to them the situation, and introducing them to totally new perspectives, both theologically and politically. All of this was done under the threat of severing relations and funding when Palestinian evangelicals took positions too divergent from the positions of the “mother churches” in the West. The reaction of Palestinian evangelicals to Christian Zionism fell along two distinct lines: The first was to join with other Christian denominations in Palestine and take with them a unified stand against Christian Zionism, the occupation and settlement policies of the State of Israel, and its violations of human rights, and in favor of the accepted and inalienable rights of the Palestinian people and its national aspirations. This position was both political and theological. The second path was to develop their own distinctive evangelical response based on scripture and a theological interpretation of the Bible, with a clear mission to communicate that view to evangelicals in the West. Palestinian Christian church leaders have, in fact, taken clear and public positions and signed numerous petitions regarding the occupation and its practices, which rejected Christian Zionism. Evangelical Palestinians have generally and consistently affirmed and joined such efforts and participated in taking clear positions along with the other Palestinian Christians and contrary to the positions of Western Christians. In addition to signing and validating such petitions, Palestinian evangelicals have also joined relevant ecumenical institutions, such as al-Sabeel Ecumenical Center for Palestinian Liberation Theology, which the author helped establish together with Reverend Naim Ateek of the Episcopalian Anglican Church.4 This organization includes Christian Palestinians from different denominations, including evangelicals. Al-Sabeel maintains contacts with Christians from all over the world; holds a number of international conferences; publishes books, leaflets, and newsletters; and routinely meets with pilgrim groups, most often with a view to explaining the Palestinian Christian position and countering and deconstructing the claims of Christian Zionism. Al-Sabeel has also set up a number of Friends of Sabeel organizations abroad to carry out a similar function and initiate activities, including a weekly “wave of prayer” to inform their extensive contacts of ongoing concerns for Palestinians and call on them to pray for and act on behalf of such concerns. One of the most significant of these Palestinian ecumenical activities is the publication of the Kairos Palestine document, modeled after the South African Kairos document, which offered a theological critique of Apartheid from a Christian perspective and called on Christians everywhere to denounce it as a sin.5 Palestinian evangelical theologians, such as Dr. Yohanna Katanachu, were instrumental in drafting the Kairos Palestine document. This Christian theological position paper is aimed at Christians abroad and presents a critique of the occupation and human rights violations, calling for a peaceful resolution based on justice and equality. It rejects the claims of Christian Zionism and calls on Christians abroad to take specific concrete actions within the framework of BDS (Boycott, Divestment, and Sanctions) to resist ongoing oppression and to support legitimate Palestinian rights. This document was signed by the heads of all the churches in Palestine and is a useful expression of the position of Palestinian Christians in contrast to the positions often taken by Western churches. In addition to such ecumenical efforts, Palestinian evangelicals have also taken upon themselves the task of addressing Christian Zionism among evangelicals in the West, specifically from the perspective of their biblical understanding. Many Palestinian evangelicals had grown up hearing the most extreme Christian Zionist views as espoused by missionaries and were profoundly uncomfortable with the political implications of such interpretations. In true evangelical fashion, they went to the Bible to see if it did in fact support these views; quickly they found that such views were often the result of “cherry-picking” verses out of context, with little regard to the current realities on the ground, or the general message of Christ, which clearly rejected particularism and racism and preached a universal message of love, nonviolence, and salvation open to all regardless of race and ethnicity, in contrast to the teachings of Christian Zionism. Among the most important activists in this effort was Reverend Alex Awad, a Palestinian American Baptist minister who grew up in a conservative evangelical family in Bethlehem and who initially avoided all political involvement. As pastor of the East Jerusalem Baptist church, he was forced to deal with the racism of Israel, which cancelled his identity card after he left to study theology in the United States and then refused to grant him the necessary visas to stay and pastor his church in Jerusalem. His lengthy attempts to obtain that visa forced him to deal with the theological basis for Christian Zionism, which he included in his book Palestinian Memories: The Story of a Palestinian Mother and Her People. 6 In this book, he not only chronicled his own family history, but also the biblical basis in the Old and New Testaments of concepts commonly used by Christian Zionists, including God’s Chosen People, the Promised Land, the Holy Temple, Jerusalem, and sacrifice. Reverend Awad showed how these concepts were altered by Jesus in the New Testament, giving them a new meaning that differed from the narrow ethnic political interpretations given by Christian Zionists.7 The novelty of this approach is that it is fully grounded in a deep faith in and reliance on biblical positions, rather than a political polemic against Christian Zionism. In addition to the writings and preaching of Reverend Alex Awad and others like him, the Bethlehem Bible College, the largest evangelical institution today, addresses these same issues in international conferences held biennially in Bethlehem since 2010. At each of these conferences, titled “Christ at the Checkpoint,” a group of evangelical theologians and others discussed issues relating to Jerusalem, Christian Zionism, and Biblical interpretations and hermeneutics. The conferences deliberately placed these discussions in the context of the present political reality. The campus of the Bethlehem Bible College lies literally a few hundred meters from the apartheid separation wall surrounding Bethlehem; attendees can visit the wall, enter the checkpoint with Palestinian workers in the morning, and observe the practices of the occupation as they discuss different texts and seek to apply them to the present reality. Another important effort, one of many undertaken by Palestinian evangelicals in the Galilee, is the popular website “Come and See,” run by Boutros Mansour, the principal of the Baptist School in Nazareth.10 This site posts items of interest to evangelicals about the situation of Palestinian citizens of Israel, who suffer systematic discrimination and privations from the Jewish state. They challenge their evangelical brothers and sisters to see the reality of their lives and not to accept uncritically the claims of Christian Zionists. It is aimed at Western Christians, many of whom confuse biblical references to Israel with the modern state by that name, and often think of the Palestinians as a modern extension of the Philistines that Joshua fought in Old Testament times. For many of their viewers, it is a revelation to discover that there are Palestinian Christians, and even evangelicals who sing the same hymns and worship in a way that is similar to their own. What bothered Christian Zionists the most was that Palestinian evangelicals were not using the usual arguments of international law, human rights, and secular politics, but were using religious and biblical arguments that were conservative, even fundamentalist, but which rejected and challenged Christian Zionist dogma using the very language and concepts they themselves had successfully used to garner support for Israel and its policies.11 The ultimate goal of these activities, assisted by evangelical Christians, is to show that the Bible carries a message of Good News, peace, and nonviolence, and that Christians should be concerned about justice, rather than uncritically supporting any political state or ideology. This message carries weight, especially among young evangelicals. At a minimum, it shows that Christian Zionism is not, as it had been portrayed, an essential or basic tenet of evangelical thought and teachings. Jonathan Kuttab is a Palestinian attorney and human rights activist. He grew up in Jerusalem, studied in the United States, and received his law degree from the University of Virginia. He is a member of the bar associations of New York, Palestine, and Israel. 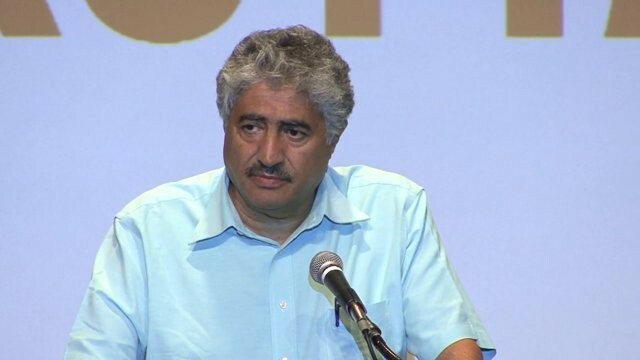 Mr. Kuttab is a founding member of the human rights organizations alHaq and the Mandela Institute for Palestinian Prisoners, and active in a number of civil society organizations in Palestine and internationally. 1. The American Israel Public Affairs Committee website, at www.aipac.org (accessed 22 October 2018). 2 See, for example, Ahmad Jamil Azem, “Moving the U.S. Embassy to Jerusalem: A Chronic Unfulfilled Promise,” Jerusalem Quarterly 70 (Summer 2017): 7–21. 3 According to the Pew Survey’s “Religious Landscape Study,” 25.4 percent of Americans identified as evangelical Christians, making it the largest religious denomination in the United States; see online at pewforum.org/religiouslandscape-study (accessed 13 November 2018). 4 See al-Sabeel Ecumenical Center for Palestinian Liberation Theology, online at sabeel.org (accessed 22 October 2018). 5 See online at www.kairospalestine.ps/index.php/ about-us/kairos-palestine-document (accessed 13 November 2018). 6 Alex Awad, Palestinian Memories: The Story of a Palestinian Mother and Her People (Bethlehem: Bethlehem Bible College, 2008). 7 See Awad, Palestinian Memories, chap. 10. 8 Based on author’s personal convervations with attendees at the conferences. 9 See, for example: Hannah Weiss, “The Controversial ‘Christ at the Checkpoint’: A Beginner’s Factual Guide,” Kehila News Israel, 7 March 2016, online at – kehilanews.com/2016/03/07/the-controversialchrist-at-the-checkpoint-a-beginners-factualguide/ (accessed 13 November 2018); and “Christ at the Checkpoint,” NGO Monitor, online at www.ngo-monitor.org/ngos/christ_at_ the_checkpoint/ (accessed 13 November 2018), among others. 10 Online at comeandsee.com (accessed 22 October 2018). 11 Other non-Palestinian evangelical writers have also critiqued Christian Zionism. Prominent among them is Reverend Don Wagner, Anxious for Armageddon: A Call to Partnership for Middle Eastern and Western Christians (Scottdale, PA: Herald Press, 1995) and Reverend Steven Sizer, Zion’s Christian Soldiers? The Bible, Israel, and the Church (Westmont, IL: InterVarsity Press, 2007). So glad. Thanks for the feedback.